Welcome to the first post of Squaduary 2019. I know I will have missed a few people from the list below but hopefully they can let me know on this post or Twitter. I am delighted to see so many people joining in already. Of note I do want to say this is not just a GW or 40K event, all systems are accepted. Let’s jump right in with the start of the pledges. 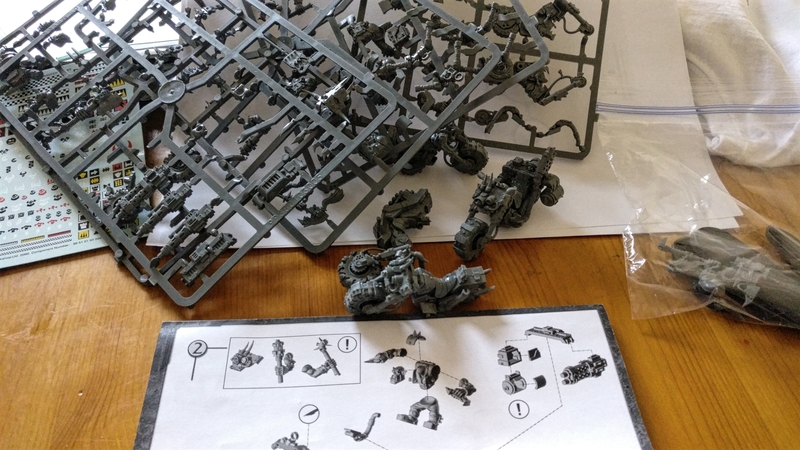 Time to get some more speed into my fledgling Ork force with five Warbikers. One will be a nob with a big choppa. Hoping to keep some bright colours and get some movement into them. Sisters of Silence. Been mean to build and paint these for awhile, aim is to get a squad sorted with a stretch goal of getting them all to table standard. I’ve had the Dark Imperium box since it came out, but haven’t done anything with it but sell the Nurgley boys. Time to bring some help to help my Wolves in their darkest hour. Incidentally, this will be the first time I’ve built infantry straight from the sprue. Should be interesting. For my Squaduary I’m doing Genestealer Cultists. Mainly and orange and grey paint job but there will be varying colours thrown in. I really like the aesthetic of the Genestealer cultists. The idea that most appeals to me is the idea that they’re trying to take down the Imperium from the inside. 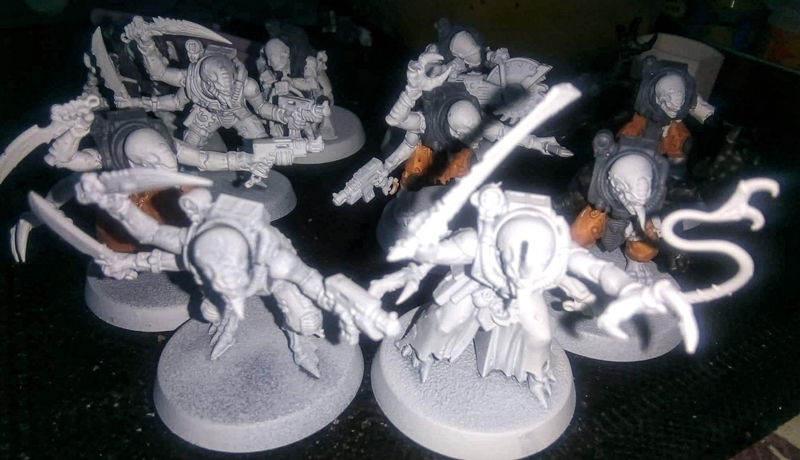 I’m making a unit of The Devoted Sons, which is the genestealer cult that comes with the Kill Team Boxed set. I’m considering what to name the cult leader but my most prominent idea just now is Squiggle the Destroyer. I hope my first Squaduary is a good one. So, this is my second Squaduary, does that make me a veteran now? Certainly I’ve lasted longer than any Imperial Guardsman ever will. So, we continue to slowly build up my Drukhari force. I am in the somewhat unusual position that I don’t actually have any unbuilt unpainted models…. 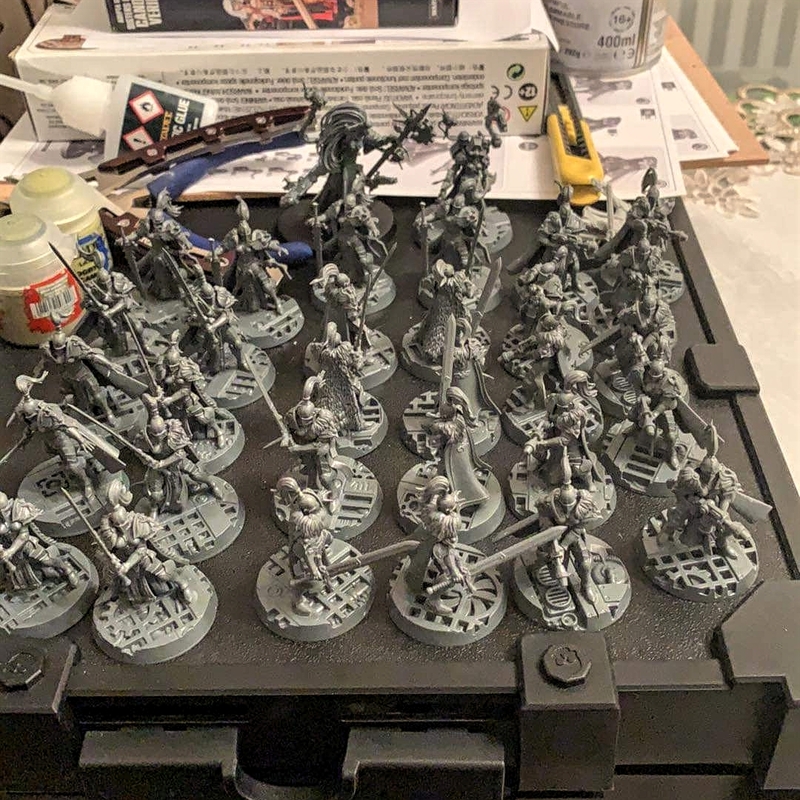 Yes I am in fact that most mythical of beasts a grey crack junkie with a fully built, painted and based army (they do exist… please don’t throw stones at me, you might miss and damage my models). 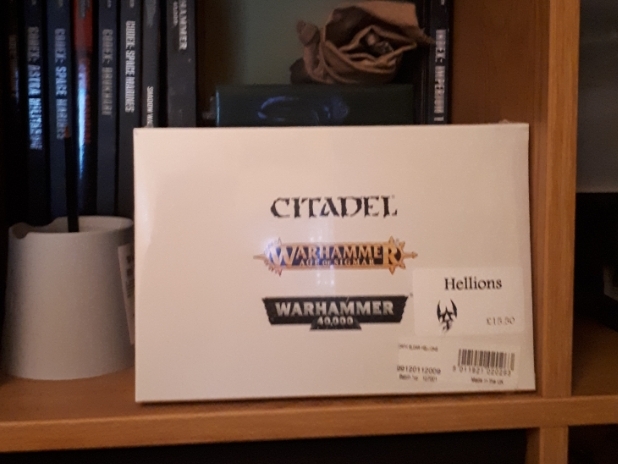 At any rate to take part this year I’ve needed to go out to Warhammer World and buy some more, so I have a nice, new, shiney box of Hellions. 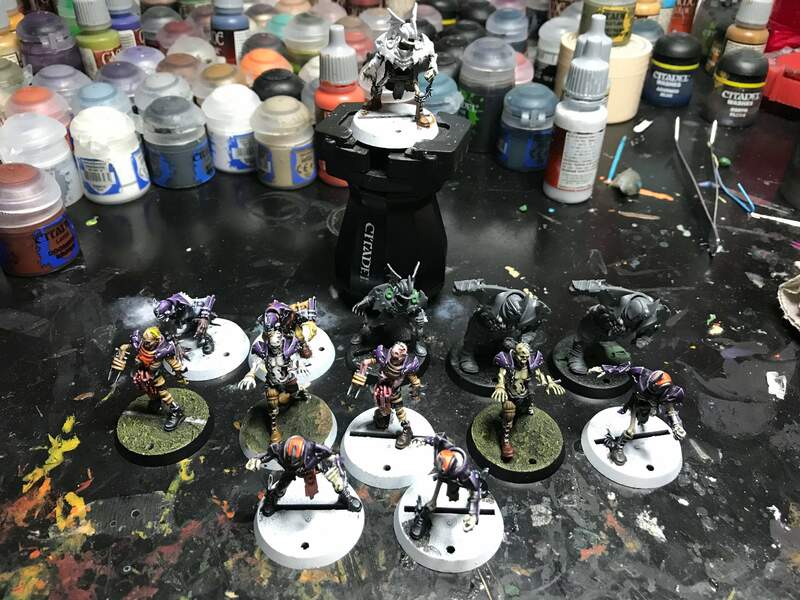 I probably do need some extra Hellions – the last time I put them on the board Silvertabby decided that what they needed was to meet the point end of a squad of 10 Genestealers. (I picked up second place in that little tussle) Next time, perhaps I can do some damage before they all die horribly. 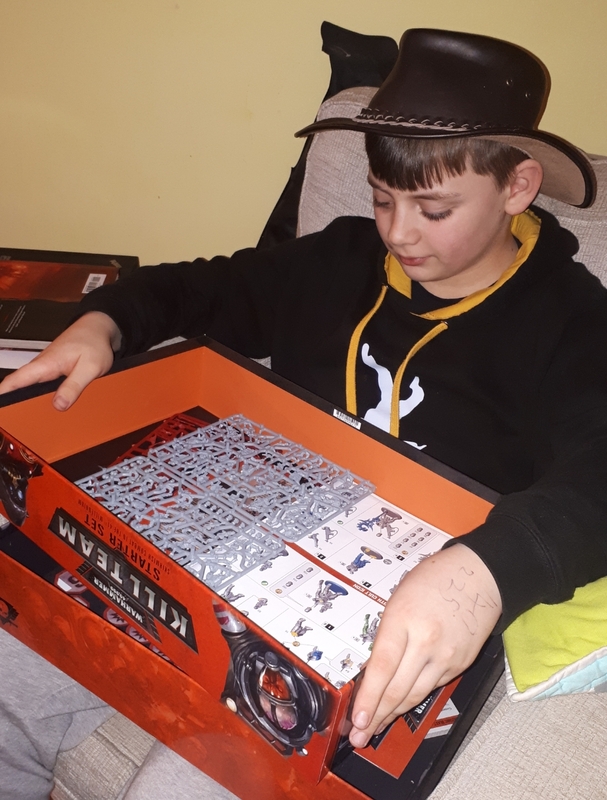 Not going to put any stretch goals in here – I’ve got my squad of Hellions but I’m also likely to be assisting FunSproggy with his first Squaduary builds to help keep him on track. These guys – and whatever I can kludge together from those sprues on the left and whatever lurks in the ghastly depths of my bits boxes – will be my Death Guard kill team. Hmm. Maybe I’ll put up my Undead team. It is mostly done, but as a slow painter, this could see me complete it. I’m in! Ad Mech Skitarii Vanguard! I’m in again this year. I’ll I’ll take on more pre-heresy Dark Angels. Pledging a squad of 5 tactical support marines and a squad of 6 heavy support marines. Both squads primed, but needing some love now that their two squads of 10 tactical brothers have seen paint. Given the difficulty in priming at this time of year, I’m going to try for building one Squad, and painting another, already primed one. 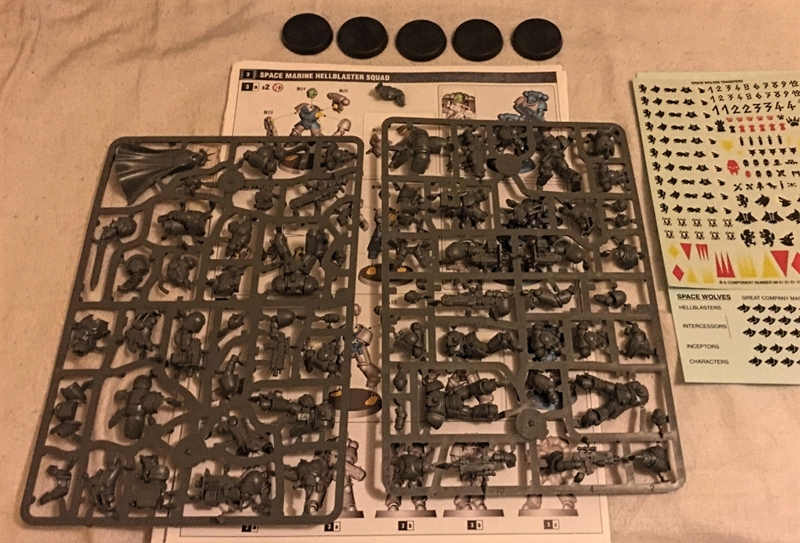 No idea what for the build, but probably some Plague Marines or Poxwalkers for the painting. I’m in, I’ve got 27 tzaangors to paint! Technically a few are started but only an hour’s work done on them. Count me in. I’m going to do the new Mechanicus kill team box set. 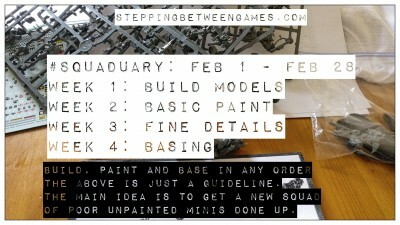 What does one do after getting burned out painting gold trim and waiting for #squaduary? Well clearly feed my complisionism needs and build all the gangs for Necromunda of course! Well that is it folks, we are off to the races! Hopefully we will have some Instagram posts over the next little while soon. Remember to click on peoples names to jump to those people’s sites. Events like this remind me of how much stuff I miss in blogging circles.